There arises multiple questions while finding a new house or to re-develop the existing one. The budget and the economy proves to be a big hurdle to surpass for the home-owners. Moreover, there are not many banks offering loans for re-construction or re-development or mortgaging their place. Though they provide the best deals, the consumers do not find those offers as interesting as they want and this issue is best solved by the re-development companies. NSH Mortgage is a Florida mortgage lender who specializes in home and purchase loans, such as the FHA 203k Mortgage Loan, & can help you get financed today. However, the banks are not the only ones to solve the issues of every loan. There are many mortgage or construction companies who willingly help in gaining the customer’s confidence by providing clients with the best and the preeminent deals. Federal Housing Administration Loans, that is, the FHA Loan, assist to give a construction loan for a mortgage or any constructional purpose of house. They will ask to provide only the necessary, requisite documents for further proofing of the loan amount. Banks provide various construction loan that can be taken for the development of the house. The construction companies or the mortgage loan companies can facilitate the customers and make to take away the deals that will suit them and their budget; as everything should be taken into consideration while budgeting. In terms of mortgaging the house or re-financing the house for a mortgage, the FHA 203K Loan can be reviewed. It is a federal housing administration loan that proves to help the people who are falling short of money or economy. It guarantees clients to provide complete satisfaction who want to take over the projects for home construction. This loan covers all the repairs within its estimated cost. There are few limiting standards that need to be reviewed before taking the loan amount. The clients mush not have had any property invested in that house which needs to be re-developed. The owner of the house is the only responsible person to apply for the loan amount. The house should not be a newly constructed one as the minimum age of it should be one year or more. In some cases the customer needs to re-establish the house by demolishing and by knocking it down fully, the home should be built on the same, existing foundation. Not only mortgaging the demolished house but it will also help for small repairs inside the structures that requires a great amount to shell from the pockets. 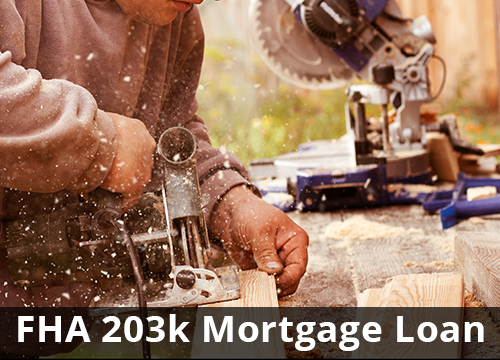 The FHA 203K mortgage loan grants all the money or the wealth needed to make the client’s house a better place to live in with all the amenities. This loan makes the client free from every setback he has for structuring and organizing a completely new home for his family. Such types of federal housing administration loans are not, usually, found with the banks. The fixation of all the problems of clients, with respect to their houses, may lie within the housing, re-constructional and re-developmental companies. Before filing and signing any documents, reviewing of the eligibility standards should be made by the house owner. If the files or petitions are not clear, an attorney should be hired. One should study the documents of the loan thoroughly to avoid any further mis-communication or misinterpretation since the house, and the house owner will be at risk. It is always better taking necessary precautions than to think about it after committing the mistake. The clarity in your post is simply great and i can assume you’re an expert on this subject. Fine with your permission let me to grab your feed to keep up to date with forthcoming post. Thanks a million and please carry on the rewarding work.